After washing all the dishes late last night and cleaning up the mess, all that's left of our Oscars shindig is a cupcake stand and plastic martini glasses to take apart and pack away. 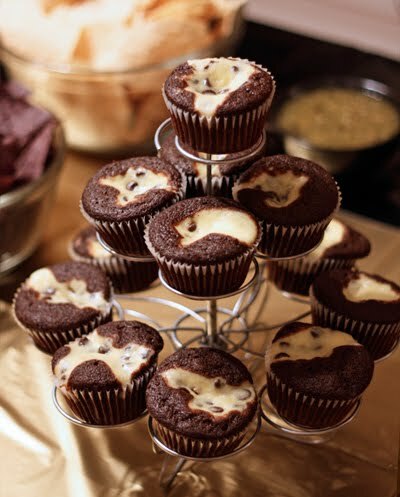 That and a bunch of Black Swan dinner leftovers, including cupcakes, black olive tapenade and goat cheese, tortilla chips, black bean and white cheddar soup, chocolate mousse, and a pitcher of white chocolate martinis. Alex left on a business trip today, so what's a girl to do but drink the whole thing herself? I wonder what time is too early to start. You have read this article entertaining with the title February 2011. 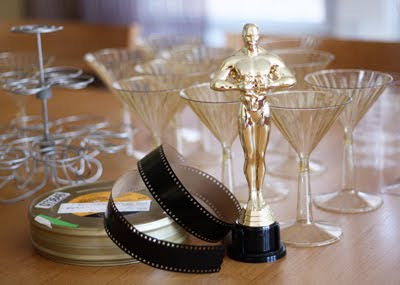 You can bookmark this page URL http://jenkrebs.blogspot.com/2011/02/oscars-aftermath.html. Thanks! 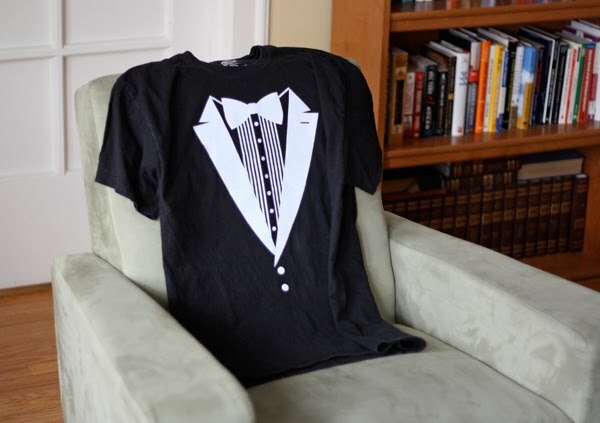 This chair is wearing Alex's new do-it-yourself tuxedo t-shirt for our Oscars party. It's the reverse of last year, when I printed the tux graphic in black on our inkjet and ironed it onto a white t-shirt. This year I happened to have some white flocked iron-on material, so I cut the pieces with my Silhouette cutter and applied them to a black t-shirt. My white stuff was only 9" wide, so it still required cutting out the graphic in two separate pieces. But if you don't look too closely, you can't see the splice. Get the tuxedo template here. You have read this article downloads / entertaining with the title February 2011. You can bookmark this page URL http://jenkrebs.blogspot.com/2011/02/tuxedo-t-shirt-upgraded.html. Thanks! You have read this article quizzes with the title February 2011. You can bookmark this page URL http://jenkrebs.blogspot.com/2011/02/quiz-guess-oscars-dress.html. Thanks! 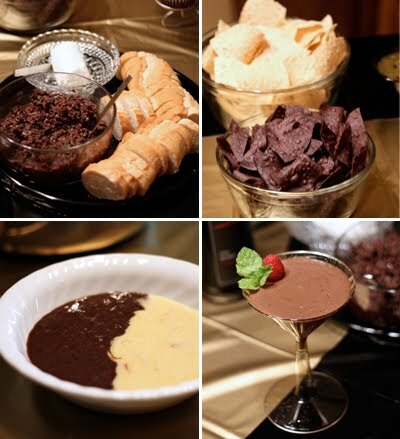 You have read this article downloads / printable / valentine's day with the title February 2011. 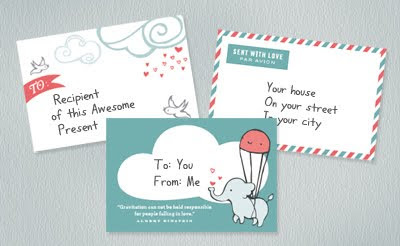 You can bookmark this page URL http://jenkrebs.blogspot.com/2011/02/cute-printable-label-freebies.html. Thanks! 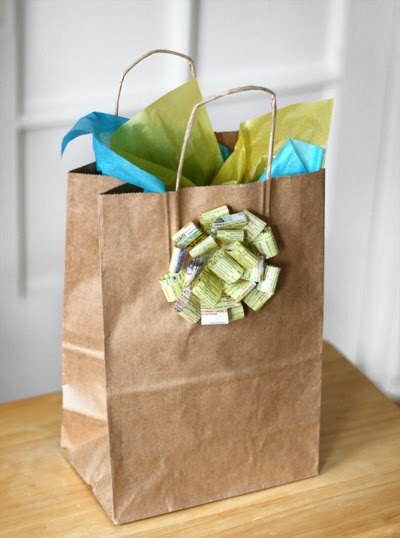 Here's a less pointy variation of the magazine gift bow. I used the yellow pages this time. Cut 5 or 6 full-length strips, depending on how full you'd like the bow to be. Cut 4 strips that are 3" shorter. Save one of the leftover short ends to use in the center of the bow. 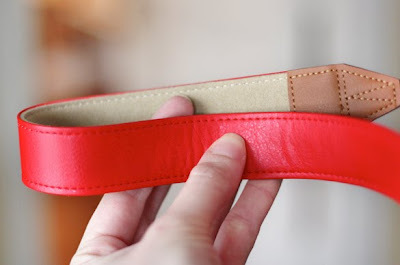 Form each strip into an "eight" shape, securing the ends in the center with tape. (The photo above shows five shorter loops, but I ended up using only four.) Make a loop with one of the 3" leftover ends. Arrange the longer pieces evenly to form a circle and staple it in the center. Swinging open the stapler helps position it without squashing the loops. Repeat with the shorter set of loops. 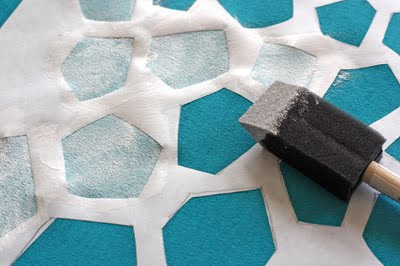 Then layer the smaller piece on top of the larger piece and staple them together in the center. Attach the single loop to the center with a piece of double-stick tape. 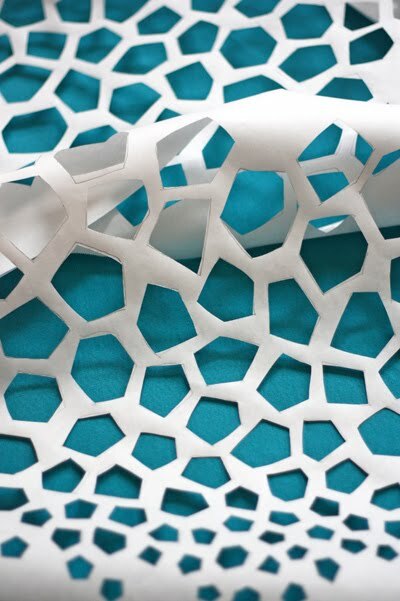 You have read this article paper / recycled / tutorials with the title February 2011. 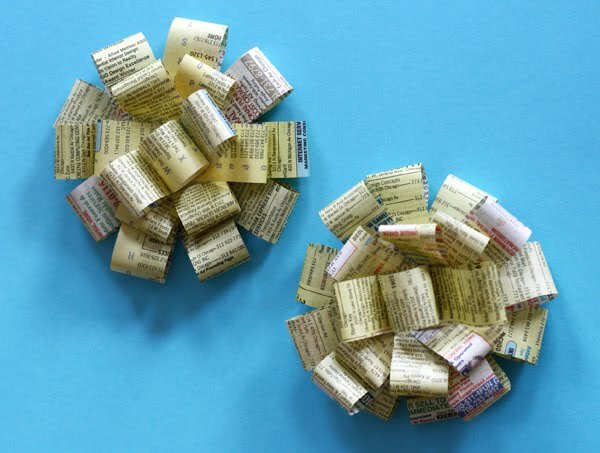 You can bookmark this page URL http://jenkrebs.blogspot.com/2011/02/recycled-gift-bows-yellow-pages-version.html. Thanks! Felt & Wire Shop is a curated online marketplace with papergoods from designers, printers, bookbinders, and artists. Find gift wrap, greeting cards, notebooks, art prints, and more! Among my favorites are Fox wrapping paper by INK+WIT, the quirky letterpressed Portraits print from Pistachio Press, and PaperPhine's useful paper twine. Felt & Wire Shop would like to give a $100 online shopping spree to one lucky How About Orange reader. To enter, leave a comment on this post mentioning one of the items you'd gladly toss into your cart. Be sure to include a link, email address, or other way of contacting you. The giveaway closes Thursday, Feb. 24 at midnight CT. A winner will be randomly drawn, announced on Felt & Wire's Facebook page the next day, and notified. Update: The giveaway is closed. Congratulations to Heather, commenter #803, winner of the shopping spree! Hey, that rhymes. You have read this article giveaway with the title February 2011. You can bookmark this page URL http://jenkrebs.blogspot.com/2011/02/giveaway-felt-wire-shop.html. Thanks! 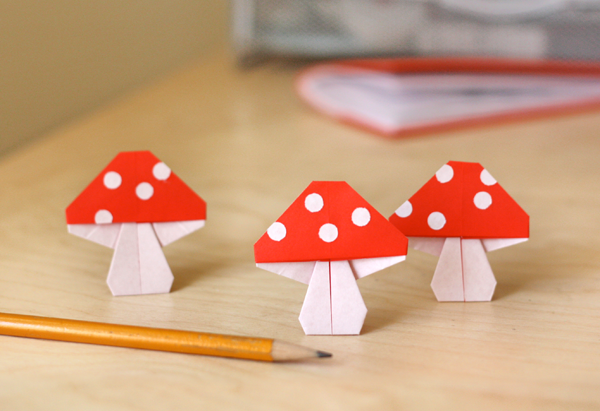 Small paper mushrooms have sprouted on my desk. 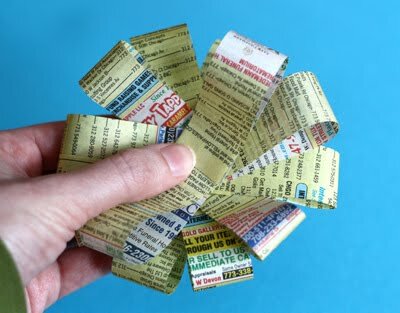 Each is folded from a quarter sheet (a 75 mm square) of origami paper. I used a hole punch to cut out spots and attached them with a dot of glue. What am I going to do with these? No idea. But they're cute. Get folding instructions here at Origami Club. 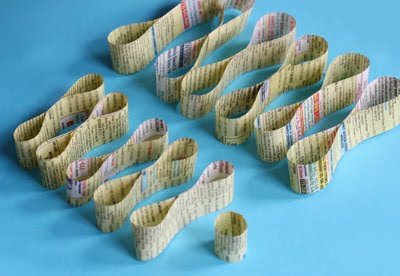 You have read this article origami / paper / tutorials with the title February 2011. You can bookmark this page URL http://jenkrebs.blogspot.com/2011/02/origami-mushrooms.html. Thanks! Odosketch is an online drawing tool capable of wasting hours of your life. View time-lapse movies of users drawing each featured sketch, or try your hand at creating your own illustrations. The color palette is charming and the results can be amazing. Thanks, Else. You have read this article time-wasters with the title February 2011. You can bookmark this page URL http://jenkrebs.blogspot.com/2011/02/draw-online-with-odosketch.html. Thanks! As defined by the Mayo Clinic, "hoarding is the excessive collection of items, along with the inability to discard them." If your computer is filled to capacity with typefaces, if you experience difficulty organizing items, or if you acquire unneeded or seemingly useless fonts, you may need help. To learn more about your hoarding disorder, click here. Or just go ahead and download another free font. Geotica is a type family comprised of 16 fonts based on simple, geometric line elements. Get the lovely Geotica Three for free from Exljbris at Myfonts.com. You have read this article fonts / graphic design with the title February 2011. You can bookmark this page URL http://jenkrebs.blogspot.com/2011/02/free-font-geotica-three.html. Thanks! There were a couple items on my Christmas list I'd been hoping to receive. Score! After using these for a couple months, I have to post a report. The red Tokyo Dreamer camera strap is fab. The strap that came with my Canon Rebel XSi is wide, black, emblazoned with Canon all over the place, and let's face it: not cute. My new strap is narrower (3 cm) with a soft, suede lining and a bright leather exterior. Er, not quite; it's actually made from "vegan leather" which is perhaps a code word for vinyl. But whatever it is, it looks just like leather. The strap is sturdy and flexible with a funny Japanese-ish phrase printed at one end. If I were a serious photographer, I suppose I would scoff at someone who cared about the color of their camera strap. Good thing I'm not a serious photographer. 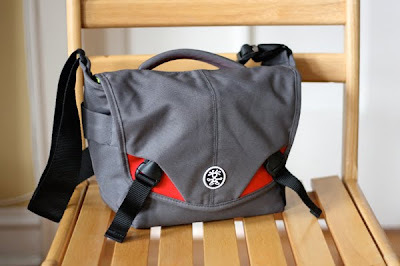 And please check out my new Crumpler 5 Million Dollar Home camera bag. My old bag would hold only the camera but no extra lenses. So when I went to shoot photos for a client last time, I wrapped up my extra lens in a fluffy hand towel and stuffed it in my purse. Never again! This bag has removable dividers and amazing amounts of storage, but it's not bulky. Lots of room for future purchases, and the quality is top notch. Did I mention the inside is lime green? Fun. You have read this article favorite things with the title February 2011. You can bookmark this page URL http://jenkrebs.blogspot.com/2011/02/stylish-camera-accoutrements.html. Thanks! Do you find the act of clicking tiny radio buttons oddly satisfying? The 2011 Bloggies are in full swing, and How About Orange is a finalist for "Best Art, Craft, or Design Weblog." This blog is also on the shortlist for "Favorite Blog with a Handmaking Focus" over at the Handmade Olympics. Vote for your favorite blogs and find some great new ones to browse. Thanks for the nominations, everyone. I'm honored! You have read this article with the title February 2011. You can bookmark this page URL http://jenkrebs.blogspot.com/2011/02/if-you-like-voting-for-stuff.html. Thanks! You have read this article desktops with the title February 2011. 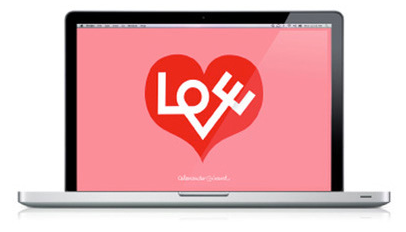 You can bookmark this page URL http://jenkrebs.blogspot.com/2011/02/alexander-girard-desktop-wallpaper.html. Thanks! You have read this article cards / downloads / printable / valentine's day with the title February 2011. You can bookmark this page URL http://jenkrebs.blogspot.com/2011/02/last-minute-valentine-printables.html. Thanks! 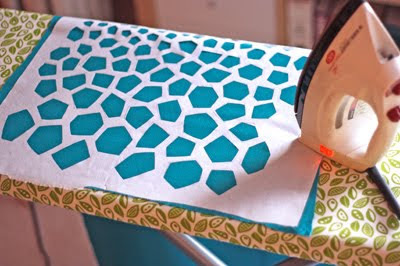 You have read this article decorating / sewing / tutorials with the title February 2011. 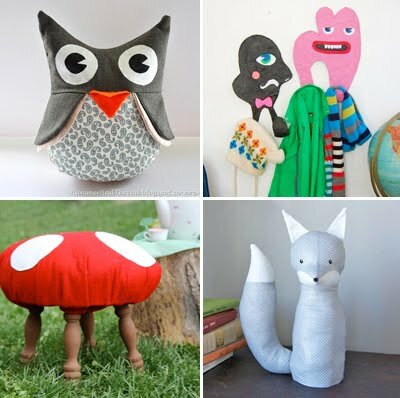 You can bookmark this page URL http://jenkrebs.blogspot.com/2011/02/quirky-tutorials-for-children-things.html. Thanks! 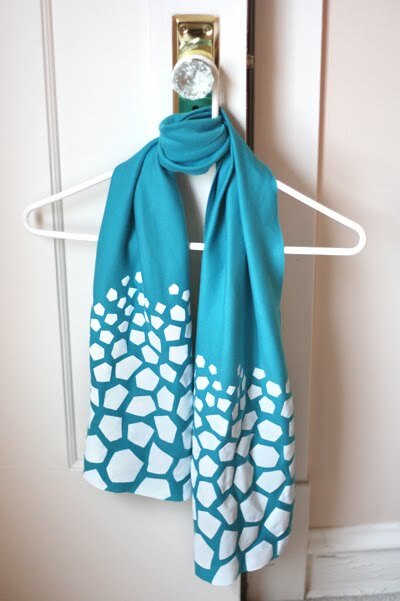 Inspired by the frozen boulders the city snowplow piled up along our street, I made a scarf. 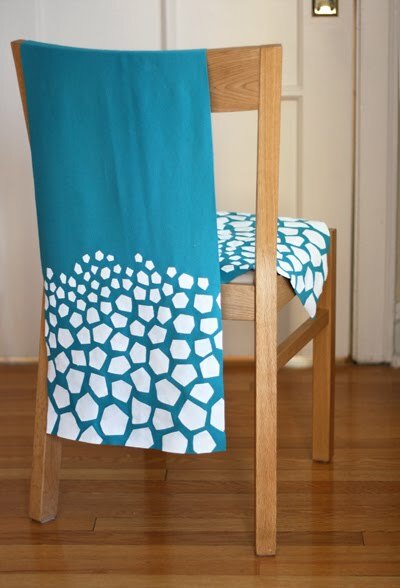 To make this, you'll need: fabric, freezer paper, scissors, iron, pencil, craft knife, cutting mat, fabric paint, and a foam brush. I used a length of jersey from the fabric store—you know, T-shirt material. Soft and comfy, and doesn't fray around the edges. I sketched an abstract design onto the uncoated side of the freezer paper. 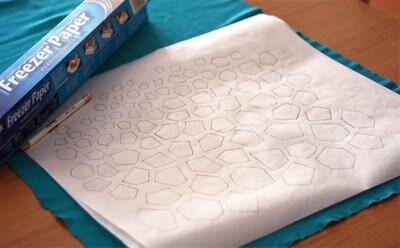 These were just messy hexagons and pentagons that got gradually smaller. A pattern of all straight lines is much quicker to cut than curves. Since I wanted the graphic at both ends of the scarf, I traced the original design onto a second piece of freezer paper. With an X-acto knife, I cut out the shapes. Each piece took about 20 minutes—though I was watching HGTV at the same time, so you might be more productive and less likely to cut off a limb if you pay closer attention to what you're doing. I ironed the stencil shiny-side down onto the fabric. The freezer paper sticks like magic. I let the paint dry and tore off the paper stencil. Then I trimmed along the scarf edges with a rotary cutter so the design would extend off the sides. You have read this article tutorials with the title February 2011. 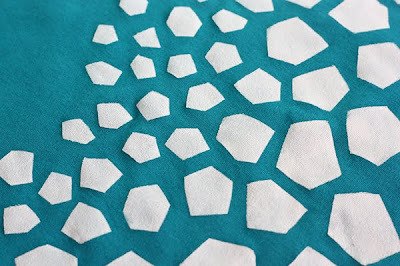 You can bookmark this page URL http://jenkrebs.blogspot.com/2011/02/diy-freezer-paper-stenciled-scarf.html. Thanks! Fossil's website is currently a wonderland of goodies, including desktop, iPad, and iPhone wallpapers made by their design team. How come everything Fossil creates is cool? What's in the water over there? If they sold bottles of it, I'd buy some. You have read this article desktops with the title February 2011. You can bookmark this page URL http://jenkrebs.blogspot.com/2011/02/vintage-style-wallpapers-at-fossil.html. Thanks! The Academy Awards draw nigh! Due to popular demand, I've updated Oscar Bingo for 2011. Download and print twelve different bingo cards. Give one to each of your party guests and race to see who can mark off five squares in a row on February 27. The annual disclaimer still applies: My psychic powers are weak, so I have no idea if it will be possible to win ten minutes into the telecast, or if there will be a winner at all. Good night, and good luck. Update: Looking for 2012 bingo? Get it here. You have read this article entertaining with the title February 2011. 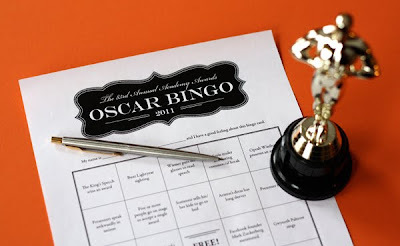 You can bookmark this page URL http://jenkrebs.blogspot.com/2011/02/oscar-bingo-2011-edition.html. Thanks! You have read this article origami / paper with the title February 2011. 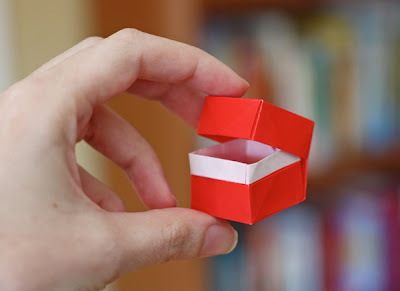 You can bookmark this page URL http://jenkrebs.blogspot.com/2011/02/origami-box-with-lid.html. Thanks! 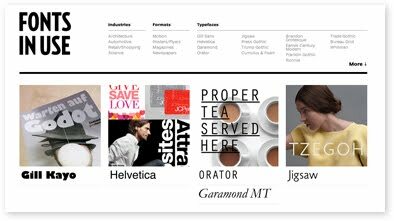 Fonts in Use is a site that catalogs "type at work in the real world." See examples of dozens of typefaces put to good use and get inspiration for your next project. Via Coudal. You have read this article fonts / graphic design with the title February 2011. You can bookmark this page URL http://jenkrebs.blogspot.com/2011/02/typography-on-nicely-designed-things.html. Thanks! You have read this article fonts / graphic design with the title February 2011. You can bookmark this page URL http://jenkrebs.blogspot.com/2011/02/free-font-lovedrops.html. Thanks! Happy February, everyone. 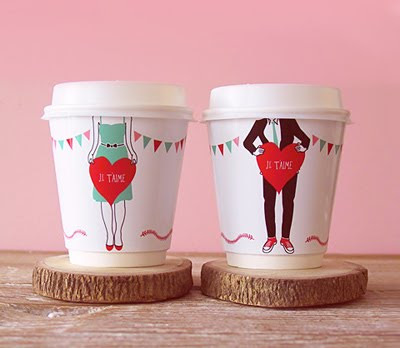 Check out these cute, printable classroom Valentine freebies at One Charming Party. Send them with your child to school or hide one in your sweetie's sock drawer. You have read this article downloads / printable / valentine's day with the title February 2011. You can bookmark this page URL http://jenkrebs.blogspot.com/2011/02/printable-valentine-cards.html. Thanks!